Cables are an inseparable part of all battery hungry gadgets. Whether you are using a laptop, tablet, or mobile, you will surely want to let your work done in an easy and quick way. Carrying a USB cable with yourself is a smart decision, as they come useful in various ways. You can charge your device or transfer data quickly from mobile to laptop or vice versa whenever you need using USB cables. 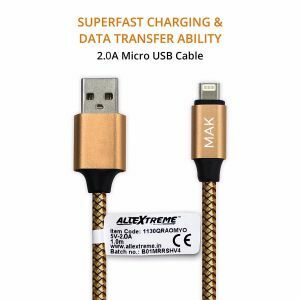 If you too want to buy US cables, AllExtreme is the best destination for exploring a large range of high performance, durable, and versatile USB cables under one roof. Made using the most advanced technology and materials, our range of USB cables are praised by our patrons to help in transferring files at high speed, and charging the devices at high speed. We understand that different people have different needs and thereby present our collection with different technical specifications. So, what are you up to? Explore our collection to have a great shopping experience.